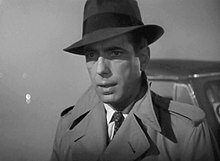 Humphrey DeForest Bogart (December 25 1899 – January 14 1957) was an American actor known for his dramatic and film noir roles in early 1940s films such as Casablanca and The Maltese Falcon. Attributed without citation in Vivian Cook, "Can they spell your name in Karachi? British and American style spelling"
Alleged last words, but Bacall denies this. Lauren Bacall. By Myself and Then Some.